WHEN you start your adult life risking everything on a refugee boat in dangerous seas, the challenges of business can look far less daunting. Mr Christopher Do made that perilous journey from Vietnam to Australia in 1981 and seems to have never stopped striving since. He started engineering firm IEV Holdings in 1987 with just A$20,000 of his own cash and built it up to where it is now, a thriving company listed on the Singapore Exchange with a market capitalisation of $86 million. Mr Do, 52, says his focused approach to business came from his upbringing. 'My life has always been full of challenges... nothing comes easy, you've got to fight for it,' he says. He spoke only Vietnamese and French when he landed in Australia, although he had picked up a smattering of English during the the four months he spent at sea. That did not stop him for long. He eventually graduated from the University of New South Wales with an honours degree in mechanical engineering and landed a coveted job at oil giant Esso. 'There were more than 80 first-class honours graduates, and they picked only two... and I wasn't even Australian,' he says, hardly concealing his pride. He spent two years at Esso as an inspections engineer before being promoted to marine operations engineer but he left after feeling 'unchallenged'. When Mr Do left, he had an invention in mind: a device to control marine growth on marine structures such as oil rigs and jetties. It utilised ocean waves, swells, tides and currents to prevent microbial slime forming. This eliminated the need for periodic cleaning and, since no additional power is required, cleaning costs are substantially reduced. The A$20,000 he had saved from working at Esso allowed him to produce a prototype, and he began efforts to secure venture capital. He also tapped Australian government export grants for funding to get his invention patented. 'By the time I saw the VCs (venture capitalists) in Sydney, I had a self-written business proposal and A$110,000 contributed by friends and family. The invention won IEV its first contract in 1990 - a A$300,000 deal to maintain an offshore installation for five years. 'It was a big breakthrough. At that point of time, it was just myself, the part-time account assistant and one other guy. After leveraging on its initial success, IEV moved onto bigger projects and diversified its product and service offerings in offshore platform insulation and corrosion control. Its clients are across the globe, found wherever oil and gas platforms operate, while the headcount is around 250. In 2005, it ventured into the energy industry, providing compressed natural gas to industries without pipeline access. By 2008, it had two plants, in Indonesia and Vietnam. 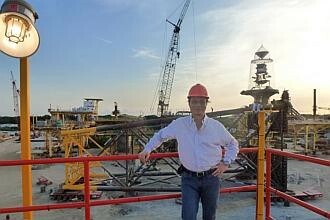 He moved the firm from Australia to Malaysia in 1989 to cut down on overheads before his most significant corporate step: a listing in Singapore. The initial public offering was held last year, with shares priced at 30 cents apiece. They closed at 52.5 cents on debut, one of the best first-day performances on the SGX last year. The stock closed unchanged at 50 cents yesterday. 'We went for the IPO because we had been at the crossroads with growing the company,' he says. The listing raised $8.7 million, allowing the firm to eliminate its debt. Mr Do also notes that the IPO success emboldened IEV to take on bigger projects, such as refurbishing old offshore platforms, in contracts worth as much as US$100 million (S$125 million). Its order book jumped sharply last year, surging from RM43.5 million (S$17.2 million) in September to RM280 million this February. The firm reported revenue of RM80.8 million for the year to Dec 31 and net profit of RM11.2 million. It been a striking story for a youngster who braved it all on that boat from Vietnam but Mr Do knows it has been worth it. 'To be successful, you have to make sacrifices. I may have money, but barely any time at all,' he says. He clocks 75 to 80 working hours a week.